I'm still playing with my new set and papers! I did mention how much I LOVE this new "True Friend" set??? 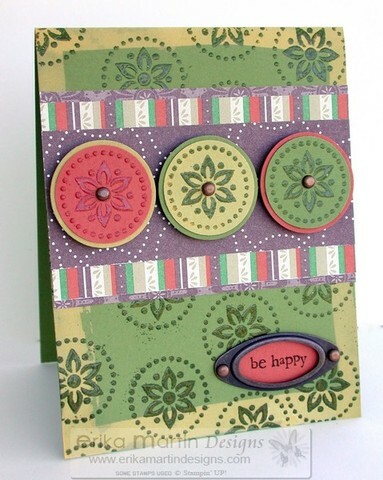 And how much I LOVE this new "Apple Cider" double-sided designer series paper??? 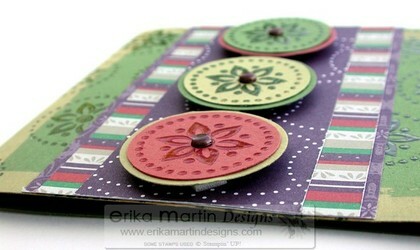 Okay, let me tell you again....I LOVE THESE PAPERS AND THIS STAMP SET! And I'm loving bleach right now! Yesterday, I was messing around with a bleach wash, so I wanted to try a couple new things out today. I love how bleach totally transforms cardstock....and the best thing is, it's like a surprise when you put bleach to paper. You never really know what color it's going to turn when you first start experimenting with a certain color. I used Old Olive as my card base and put my bleach to it and it turned it a delicious yellow-green color, reminiscent of a yellow apple. You can see this as a border around the Old Olive card, on the medallion image in the middle and the larger circle mat under the Really Rust medallion. 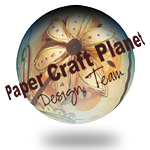 I was also playing around with the paper, stamps and punches yesterday and realized that one of the images fit my 1 1/4 inch circle punch. I couldn't wait to be able to play with my stamps today so that I could mess around with this concept. This card reminds me of very bohemian designs, but it's also a little bit a clash with retro colors of the 1970s and the color of the appliances back then. And then I looked a little closer at the medallion image and it reminds me of the Hex signs that you see on barns in the PA Dutch country of Pennsylvania (which is where my husband comes from.....his heritage is actually Amish and Mennonite....long story). The colors in the Apple Cider pack may be a bit on the muted and warm side, but these are some of my favorite combinations....those earthy fall colors. Those warm retro colors from the 70s. To me, this card screams "HAPPY." Even though it's not bright and zealous...with vibrant primary colors...they are happy colors to me. These colors are "me." I wanted to put the greeting inside of one of the book plates that comes in the Hodgepodge Hardware Kits but I found that I had to look outside this stamp set to find something that would be small enough to go inside the smallest of the book plates. Perfect timing on this hostess set, the So Many Sayings set ( a Level 1 set). I got this set a couple weeks ago and it was perfect for that little book plate. 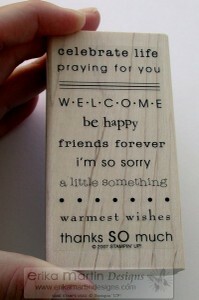 I wanted to use the "be happy" greeting from one of the stamps in this set. What I did was turn the stamp over, rubber side up. I then took my Chocolate Chip Stampin' Write Marker and only inked up the "be happy" greeting, then stamped it onto Really Rust cardstock. I trimmed the cardstock to the size of the book plate. I then adhered the Really Rust greeting onto the card base and then attached the book plate over the top of it with mini brads (also from the Hodgepodge Hardware kits). I wanted to give the card a little more dimension, so instead of just adhering the medallions flat onto the patterned paper strips, I popped them up with some Stampin' Dimensionals (aka: Pop-dots). It added the perfect finishing touch for my card. Have you checked out GinaK's blog lately? She is keeping a running tally of how many sets we've sold and how much money we've raised for Autism Speaks. Click on over to her blog: A Day in the life to see what the tally is every day! You'll be AMAZED to see what it's up to! And I'm amazed to see that so many people have helped with our cause. The numbers are climbing and this is only the beginning!!! 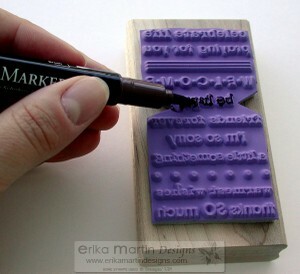 This stamp set isn't just for crafters that have autistic children. 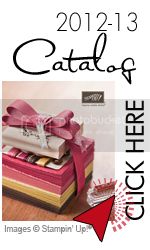 This set is ideal for scrapbook pages, cards, gift ideas and SO MUCH MORE! And the best thing about it??? You get an awesome stamp set AND you're doing something wonderful by donating to a wonderful cause: Autism Speaks .....an organization that has a goal to change the future for children and adults with autism......This CAN be done and YOU can be a part of this! We CAN make that challenge!!! I KNOW we can do it! ***Autism is a condition whose treatments are specifically excluded by some insurance companies. Yes, believe it or not.....the third most common developmental disability is also one of the conditions where parents and adults have to FIGHT for their insurance to cover much needed intervention and treatment. Let's do our part and help to fight with these parents and adults! Have a beautiful Easter weekend......I'll have a wonderful guest artist to share with you on Monday, so make sure you check back! I'll also be posting some fantastic projects that I've created......JUST FOR YOU!